This idea for a guest book alternative is so sweet because it will give you a memory that will last a lifetime, that you can share with friends and family in an interactive way. Rather than flipping through a photo album in order to remember your big day, you can play a group game! 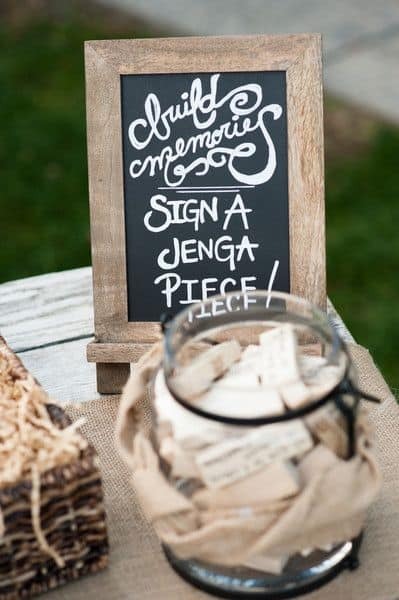 Instruct your guests to sign a face of a Jenga block. This gives you more than two hundred available spots to sign! Use a permanent ink that won’t wash off, and test it yourself first to make sure that it works perfectly and doesn’t smudge. Think about how much fun it will be to play this game with your kids in the future, and tell them stories about Mom and Dad’s special wedding day!